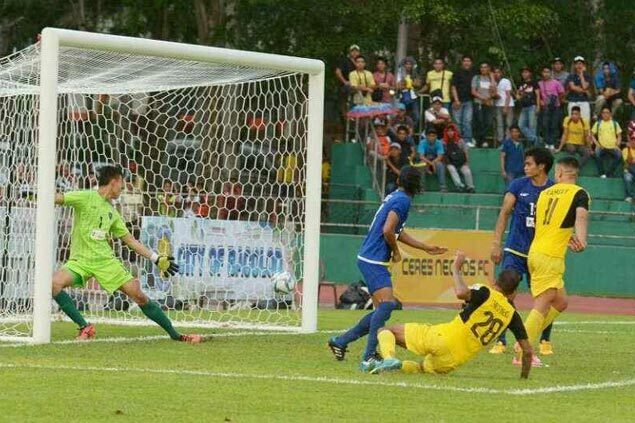 BACOLOD - Jeffrey Christiaens became the first ‘Visayas Clasico’ hero as his late goal propelled hosts Ceres Negros F.C. to a thrilling 1-0 victory over Global Cebu F.C in their titanic clash in the Philippines Football League on Saturday at the Panaad Park and Stadium. Christiaens broke the deadlock right in the 83rd minute, much to the delight of the loyal Negros fanbase who trooped to the Panaad Stadium. Substitute Stephan Schrock came in the 62nd minute and quickly made his presence felt as he sent a lovely cross right into Christiaens, who sent a half-volley past a very game Patrick Deyto. “It’s nice to score. The most important is three points. I’m just the lucky one to score,” said Christiaens in the post-match. “Schrocky did a great job. He put it perfect, right in front of the goal. I didn’t think, I just put at the back of the net,” he added. Just a few days removed off their respective AFC Cup matches, it was expected to see both clubs come out as sluggish. However, fans were treated with a very sound and technical game, with both squads playing high quality football. Chances came aplenty, particularly for the hosts with Martin Steuble, Bienve Maranon and Iain Ramsay all getting chances to score but Deyto proved to be just too good to be beat. But just like in their past couple of games, the Cebuano side were once again left frustrated in the end after conceding a late goal for yet another heartbreaking defeat, their first in this tournament. “Defensively they were very strong. We insisted, and we scored finally and I’m very happy for the players,” said Ceres head coach Risto Vidakovic. “It’s not easy to play these kinds of games, especially coming off an important match. Thankfully my players were very professional and they did a good job,” he added. With the result, Ceres got their first win of the tournament after getting a draw in their first game against Kaya F.C Makati last month. They now have four points. Global, on the other hand, dropped all three points for the first time this season as they remained at seven points after four games.